All K-12 school districts use some sort of database system for managing student information and maintaining their records. Infinite Campus is a district-wide student information system designed to manage attendance, grades, schedules, test scores, and other information about the students in the SASD. 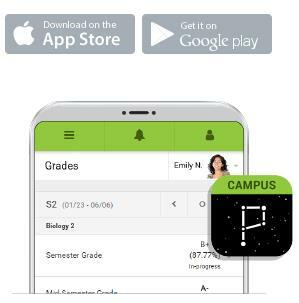 NOTE: The Parent Portal App has changed! Please download your new app before July 1. Is your Parent/Guardian Infinite Campus Portal account setup and active? Your household information accurate? This is a great tool to have to review your child's student information (attendance, grades, schedules, etc) as well as for registration and contact purposes. Please take a moment to verify by clicking on the Campus Portal link to login. If you discover you do not have an account, cannot remember your login information or other related questions, please contact the Stoughton Area School District at 608-877-5045. 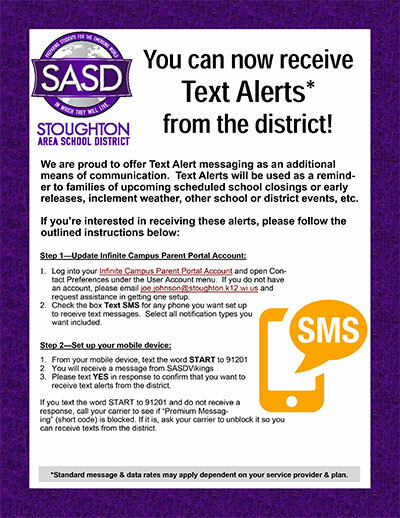 Sign up for Text Message Alerts from SASD! Click the image to view the full flyer.